Ecologies and Identities | A University of Bristol School of Law project. A University of Bristol School of Law project. Running over two days (24-25 Sept 2015), the symposium invited speakers from both the social sciences and natural sciences considered issues related to Marine Protected Areas within the wider context of marine governance in national and international contexts. Themes such as the relationship between environmental conservation and socio-economics impacts of Marine Protected Areas were discussed through multi-disciplinary lenses, next to key concepts such as “ecological networks” and an “ecosystem-based approach”. Case studies from different MPAs were presented to ground the concepts and themes in empirical evidence. Please see files below with ppt presentations and abstracts. Richard Dunne: Marine Governance in the Chagos Archipelago – a conservation success story but the failure of an MPA? Margherita Pieraccini: Divergent perspectives of new marine protected areas: comparing stakeholder legal consciousness in Scilly and Barra, UK. On the 27th of January 2015 Margherita Pieraccini (project PI) run a stakeholder workshop in the Isles of Scilly, St. Mary’s island.The workshop was used to report finding of the primary qualitative research conducted in the Isles of Scilly by the project PI, to compare the experience of Scilly with other case studies and to discuss ways forward in marine governance in the Isles of Scilly”. On the 22nd July 2014 we took part in a workshop in Castlebay, Barra, organised by the local group Voluntary Action Barra and Vatersay. 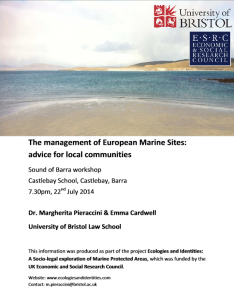 The workshop was to discuss the potential for community management of the Sound of Barra marine SAC (a European protected area). As of yet, there are no community led SAC management schemes in the whole of Europe, so the Sound of Barra could potentially become the first scheme of its type, leading the way for other local communities who are keen to play an active role in protecting their local marine environment. The materials created for the workshop have been added to the resources page of our Ecologies and Identities workshop. They cover the legal basis of European Marine Sites (such as SACs and SPAs) and can be used by any local community group interested in the potential of community management. 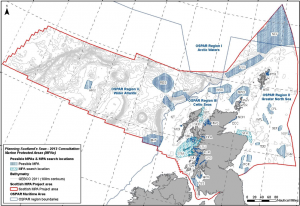 On 24th July 2014 the Scottish Government announced the designation of 30 new MPAs. Compared to England, where only a small fraction of potential MCZs have yet been designated, this Scottish network is pleasingly large, with almost all the 33 proposed MPAs now designated. Of the 33 proposed Scottish MPAs, some represented alternatives, which means the Scottish Government have effectively designated their entire proposed network. The designation process in Scotland can be seen in many ways as an improvement on that in England, where as yet only 27 of a potential 127 are in force, although more are hoped to be designated by the end of 2015. However, a large question mark still hangs over management in Scotland. Although Scotland has outlapped England when it comes to Designation, the Southern state may have the edge when it comes to monitoring and enforcement of their new protected areas. 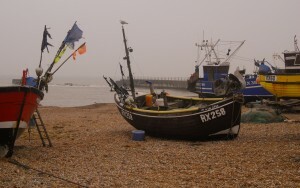 On top of the national management agency the MMO, England has a number of local IFCAs (Inshore Fisheries and Conservation Authorities) with their own boats and enforcement capabilities to monitor and police their local inshore protected areas. Scotland’s network however relies on the more limited capacities of the national enforcement arm of Marine Scotland, which has only two vessels for the entire Scottish coastline. The Scottish Government should be congratulated on the MPA designation process, which the UK Government could learn much from. Lets hope the same can be said of MPA management, and that this admirable network does not amount to a series of paper parks. More on Scotland’s new MPAs on the Scottish Government website. Update on English designations from the UK government (PDF). An article about the Marine Conservation Zone designation process written by Margherita was published in The Conversation today. Photo Michael Maggs, The Conversation. It discusses the level of public satisfaction with the designation process, and reminds readers of the importance of the Government’s obligations under the European Union (EU) Marine Strategy Framework Directive 2008. You can read the article in full on The Conversation website. In this short film made by Sam Mansfield and Margherita Pieraccini fishermen from the South East of England discuss the marine protected area network in their local region, and the marine conservation zone designation process they were involved in, Balanced Seas. The issues they raise include the relationship between area based management and quota management under the CFP, the confusing multitude of designations and acronyms within the protected area network (NTZ, MPA, MCZ, SAC, EMS) and a lack of responsiveness in the designation process. Interestingly, in last week’s designation the government stated that the decision to designate Hythe Bay (mentioned by Paul Joy in the video) would be postponed until 2014. This was the only potential MCZ to be treated in this way – perhaps reflecting how contentious designation of the area is. After a four year design process and a lengthy consultation, DEFRA announced today what the form of the Marine Conservation Area network would be. Only 27 have been proposed – significantly fewer than the 127 that were suggested by the regional stakeholder workshops (Balanced Seas, Finding Sanctuary, Net Gain and Irish Seas) in 2011. From the 31 potential MCZs put forward for designation before the public consultation began, four will not be designated. These are Stour and Orwell and Hilbre Island, which will not be designated, North of Celtic Deep, which will be considered in the next tranche, and Hythe Bay (in one of our case study sites) for which a decision will be made next year. The Scottish consultation on the proposed network of 33 MPAs will end this Wednesday, the 13th of November. This means this week is your last chance to have your say on the marine protected areas planned for Scottish seas. The proposed MPA network for Scotland, in a map produced by SNH, JNCC and Marine Scotland (click through for source). If you’d like to contribute to the MPA designation process, you can download a consultation response form from the Scottish Government website. This is the news blog of Ecologies and Identities, an ESRC research project based in the School of Law of the University of Bristol. Ecologies and Identities is a socio-legal exploration of the network of Marine Protected Areas in England and Scotland. It studies how different types of marine protected area are designated, how well they meet their conservation objectives, and who is impacted by them and how. On this page you’ll find all the latest news about the project, and details of any upcoming events.